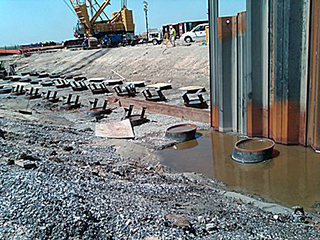 The North & South T-Walls, the key tie-in sections for the IHNC Surge Barrier project, are part of the largest design-build project ever awarded by the U.S. Army Corps of Engineers. 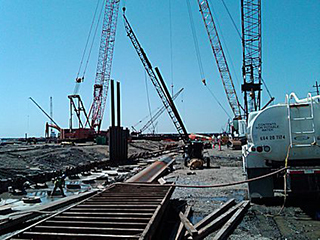 Working as a subcontractor to Shaw Environmental & Infrastructure, Inc., the project consisted of the construction of a reinforced concrete T-Wall founded on 36” diameter steel pipe pile and steel HP14x89. The 36” pipe pile average 130′ in length with the longest piles up to 146′ in length, with each pipe pile being spliced one time. 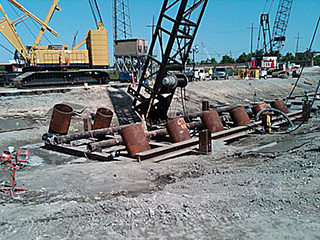 The H-Piles had lengths up to 110′ and were driven full length. All pile driving was completed with Mahan’s own work force. The North T-Wall is 617′ in total length and includes approximately 4,900 cubic yards of concrete. The South T-Wall has an overall length 571′ and approximately 4,600 cubic yards of concrete. 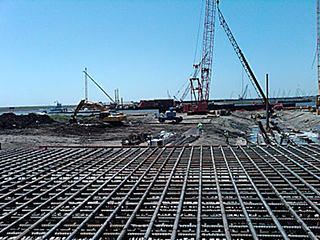 All work was completed from a series of floating marine equipment in the Gulf Intracoastal Waterway, was built on an extremely accelerated schedule, and was successfully completed on time in 8-months to provide 100-year storm surge protection by the start of the 2011 hurricane season. 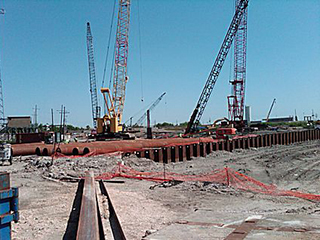 Other work included in Mahan’s scope included sheet pile installation, excavation, dewatering, reinforcing steel, and construction of temporary retaining structures.